I suppose it doesn’t sound particularly wonderful. A simple egg; that generic, catch-all term ‘curry’. Hmm. My desire to make an egg curry, however, goes back to the mid ’90s when I received a ‘curry’ recipe book that featured one. I have no idea why I never got round to making it. And the book? I’ve no idea where it is. Which means I had to make up a recipe for this protein rich, filling dish. 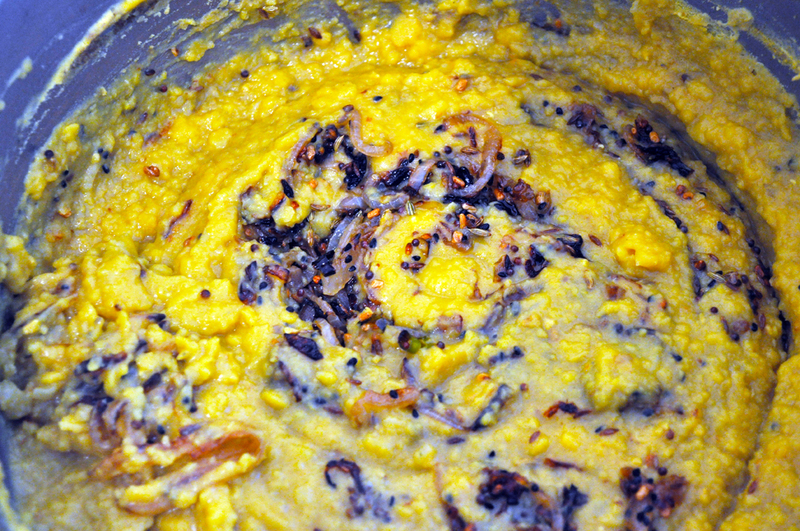 The ‘curry’ is in fact a basic dhal that we then perked up with some extra ingredients on top. 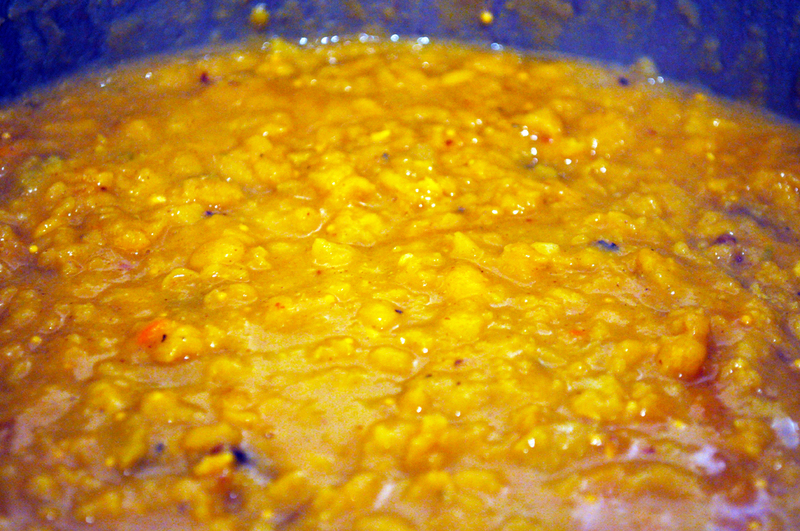 For our basic dhal recipe, see here. I think dhal plus a boiled egg could be a little cloying on its own, so to balance the flavours we added some tangy sweetness in the shape of some cherry tomatoes, and some savouriness in the form of crispy fried onions. 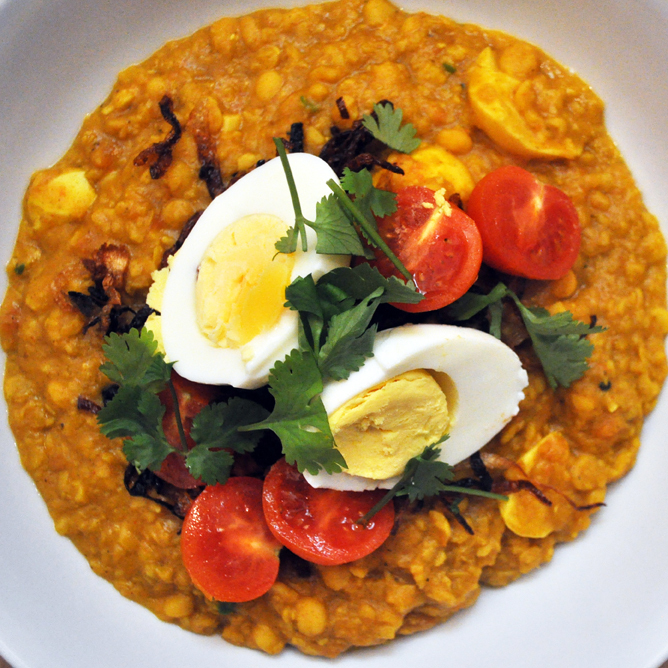 The eggs were boiled, straightforwardly, and have of them added to the dhal, half reserved for the top. The dish is finished with a little chopped coriander. It’s the balance of those added extras that makes this work. And, after 17 years of waiting, I really rather enjoyed it. I thought we should end the year with some of the recipes and dinner ideas that never quite made it to the blog when they were initially intended. 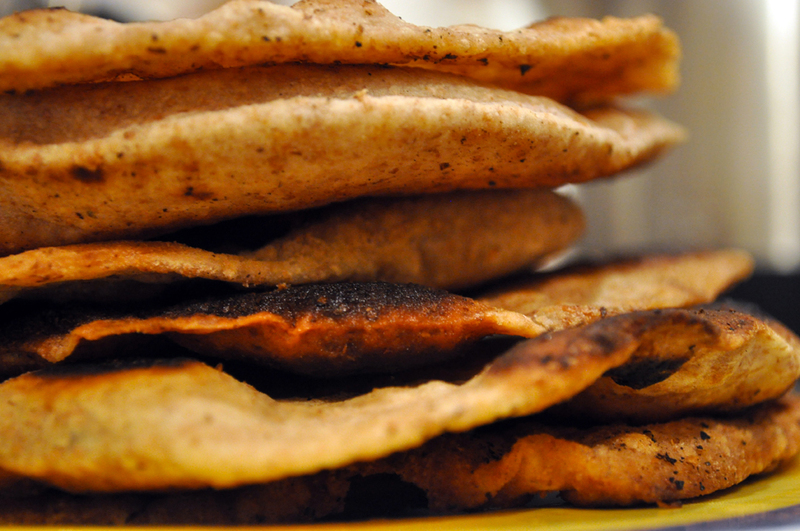 First of these is a recipe for parathas, the shallow-fried bread that is a great accompaniment to Indian food. We made them, or should I say Ella made them, a couple of months ago. We compared and contrasted a couple of different recipes before beginning, mainly because the wording wasn’t always clear, especially as to the rolling out of the dough. The general idea is that you make your dough, divide it into individual portions, roll it out, add a little oil, and then bring in the ends to the middle (using one method or another) to create a kind of folded sack that traps air inside. The dough then gets rolled out again before being shallow fried. With the shallow frying, don’t leave them to get too crisp, the finished bread needs to be soft and doughy. There’s a recipe here, and another here. Okay, and another here. It’s worth taking a look at as many as you can before commencing, but really, once you get the idea, they’re incredibly simply and a something of a treat. 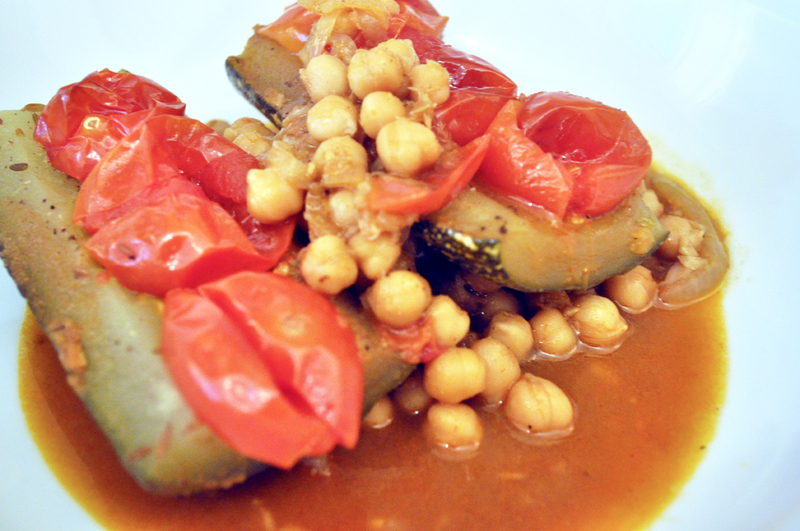 What to do with a marrow, those overgrown courgettes of delicate flesh and almost no flavour. Hmmm. We’d never cooked one before but inherited one from our neighbour. An internet search brought up a Southeast Asian recipe from Simon Hopkinson. It’s made with cherry tomatoes. Yeah, it shouldn’t work, should it?! But it does. Except, we added some chickpeas and a little chilli. But apart from that followed the recipe, here. It’s really good: the marrow flesh falling-apart soft, the tomatoes tangy and a warm zip of spices. It’s not often we make something that’s basically, er, ‘Indian’, but that isn’t like anything we’ve tasted before. And it really didn’t sound promising. Saturday morning and we just watched Anjum Anand cook Bengali butternut squash with chickpeas on one of the repeat sections on the BBC’s Saturday Kitchen. It’s been a while since we used butternut squash in a curry. Maybe it’s time to put that right. For my birthday last month, lovely cousin Ruth got me a selection ‘East End’ treats for the kitchen. These included some amazing dried chillis, an assortment of spices, a rather lovely pan and the 100 Essential Curries book by Madhur Jaffrey (you can order it here). I’d really rather forgotten about Madhur Jaffrey – it seems an age since she was the only person cooking non-European food on TV in the UK. The little book is really rather good. We fancied a dhal and something to go with it. 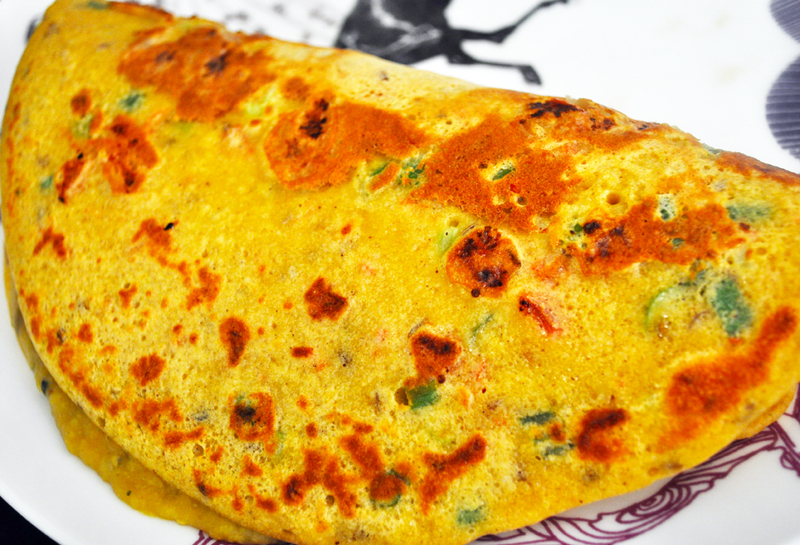 As I had half a bag of chickpea (gram) flour in the cupboard these pancakes (properly known as tameta kandana poora – chickpea flour panckakes with tomato and onion) really fit the bill. Really easy to make – like all pancakes – and a nice change from rice or bread. No recipe – as it’s not mine you’ll need to buy the book. There’s meat in the book, but plenty of vegetarian options. Worth it. 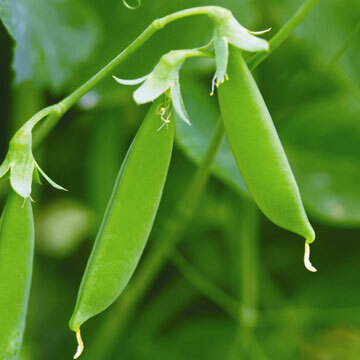 Fresh peas, picked from the garden, breaking open the pod, scraping out the peas, stuffing them in your mouth, chewing he sweet juice from the pod… nothing better. Too often bagged supermarket fresh peas are old and bitter and, while they’re okay for Muttar Paneer, frozen peas just aren’t the same taste of early summer. I don’t think many people would associate London-based chef and restaurateur Mark Hix with lovely spring veg – I mean, he might cook it, but only alongside the meaty surf and turf that he normally dishes up. And yet, there he is in the Independent with some rather lovely recipes for chilled pea and fennel soup, an amazing sounding deep-fried pea pods with minted pea mayonnaise, and a must-try pea and spinach curry. Go see here. And if you try it out, let us know how it goes. Kedgeree? I hear you gasp? Fish? Not a chance, mate. Kedgeree (khitchri, kitchari etc, to many people throughout culinary history, was never about smoked haddock or salmon – or even tuna. It was a rice and lentil (moong) dish, eaten throughout the Asian subcontinent, often for breakfast. Rice and peas, basically. This is where our take on kedgeree takes off. It’s so easy to do but does involve a few different pans. The first pan is used to cook basmati rice until it’s tender but nutty. Once cooked it’s flavoured with dried spices – a little cumin, a little paprika, a little smoked paprika and a little cumin. The second pan is to boil some puy lentils until, again, tender but nutty. 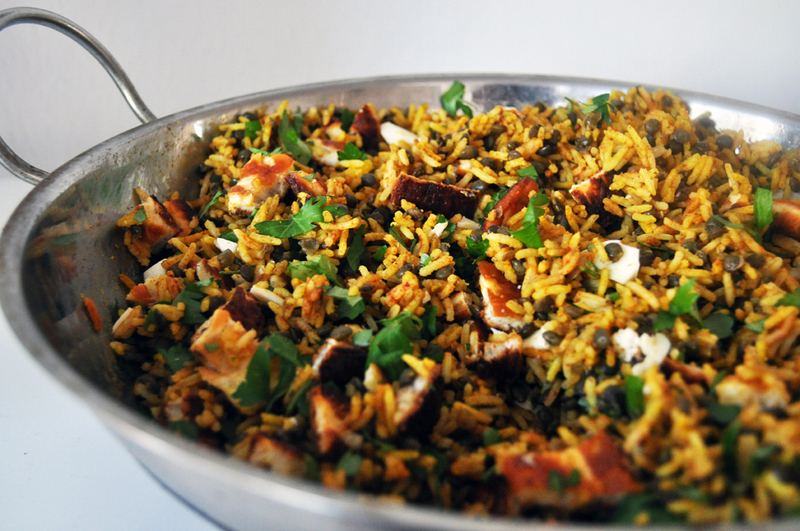 The third pan is to fry some halloumi – which for us replaces the smoky fish in most modern kedgeree recipes. The last pan is to hard boil a couple of eggs. If you don’t want to cook all these at the same time, start with the lentils, then the rice, then the eggs, then the halloumi. Once everything is cooked, combine it all together in a large pan, chopping the egg and halloumi into small pieces. 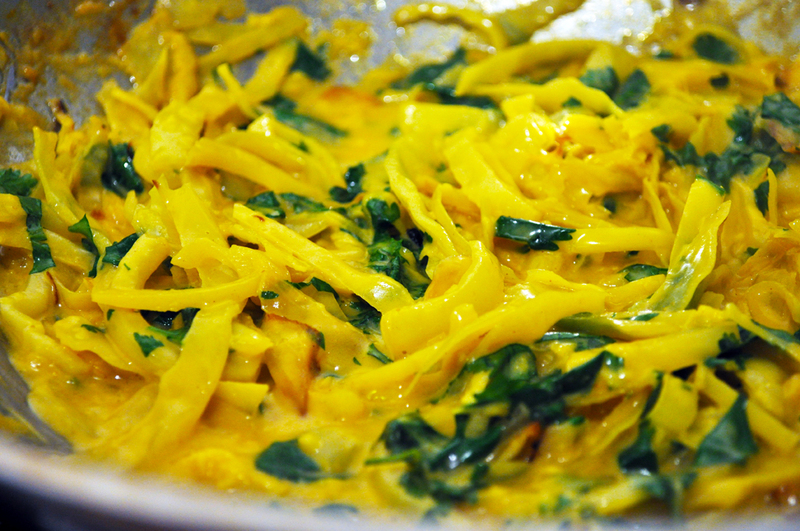 Mix it all through with a fork and then add some chopped flat-leaf parsely. Feeling rather strapped for cash, I decided to see what I could rustle up without spending a single extra penny at the shop. So, there was a bag of yellow split peas in the cupboard, a couple of onions lying around, a tin of coconut milk and half a white cabbage that was almost on its way out. Plus spices. What to do? Indian of course. We love a dhal at ETP Towers and they’re so easy. I made this after soaking the split peas for a few hours first. Then… chop an onion and fry in sunflower oil for 5 minutes. Rinse then add the split peas, plus 2 tsp cumin, 2 tsp ground coriander, 1 tsp turmeric and some chilli powder (to your liking). 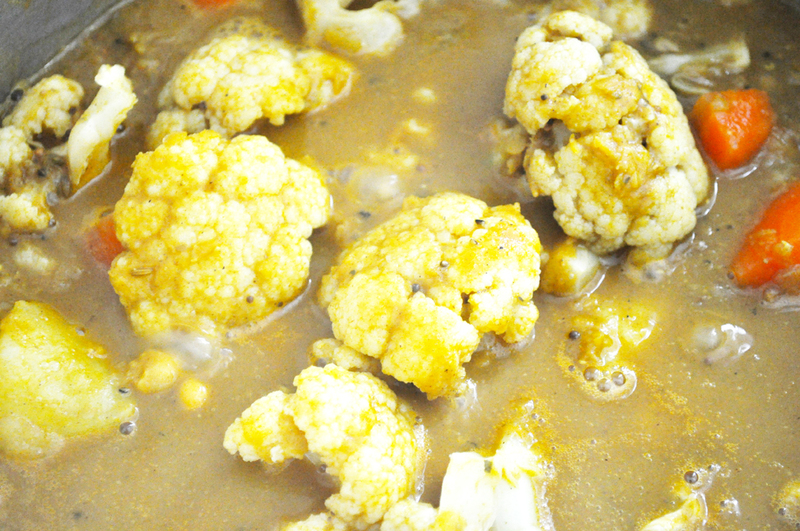 Cover with boiling water – about an inch or so above the top of the split peas and simmer for about 45 minutes until the split peas are thoroughly soft and the consitency is that of a thick sauce. Then stir in a little tamarind paste and a couple of squirts of tomato puree. Chop three cloves of garlic, place it in a metal ladle with a small amount of sunflower oil and heat over the flame of a hob until it turns golden. Stir it into the dhal mix. For the cabbage, slice an onion and half a white (or green, for that matter) cabbage and stir-fry both for a few minutes in a wok with some grated ginger, mustard seeds and a green chilli. Then add a tin of coconut milk and simmer until the cabbage softens and the milk has mostly evaporated. Regular visitors to this blog will have spotted that we don’t post our ‘Last Night’s Dinner’ entries each and every day. This isn’t because we haven’t had dinner, or because what we cooked ended up in the bin. No no no. It’s just that sometimes, for example, we eat out. Luckily, while we’re here in the City of London, we can grab Bangladeshi, Italian, Vietnamese, Mexican, Japanese – even Portuguese – around the corner. Not that we’re always so cosmopolitan – we’ve also been known to grab a bag of chips from Whitecross Street. Usually however, and more prosaically too, it’s that we either forget to take a picture or that what we’ve eaten closely resembles something that’s been posted before. Or that it’s leftovers from the previous night. Such was the case with this Monday and Tuesday’s dinner of a Cauliflower curry spiced with lots of chilli, cumin, cardamom and fennel seeds. It was pretty good on Monday and even better on Tuesday – a thoroughly enjoyable two days of eating, all made in one big pot. That kind of thing is standard issue at ETP Towers. It fills a hole and it’s just the kind of thing that we’re eating in the holes where Last Night’s Dinner doesn’t appear. Well, I say. 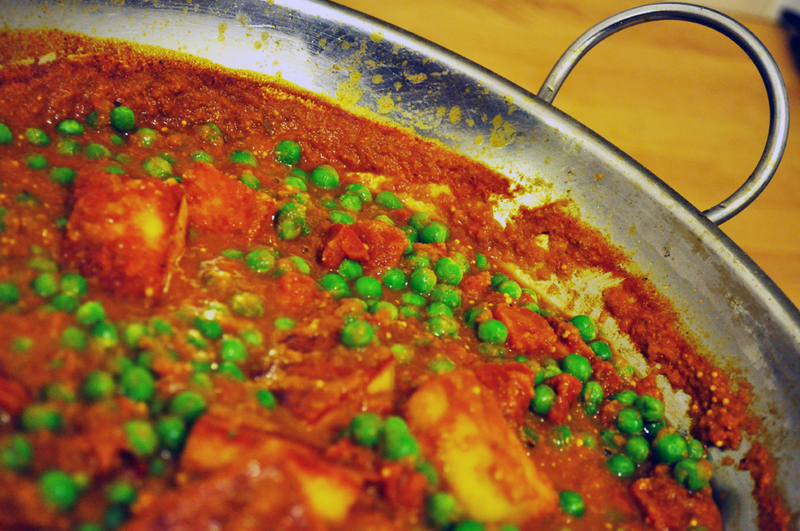 The last time we made muttar paneer (yep, that really does kind of mean ‘cheesy peas’, doesn’t it?) I was utterly disappointed. I think they had changed the recipe for the shop-bought paneer and I felt that one of my favourite Indian dishes was ruined. For the sauce I just sautee a sliced onion until softened, add 2 cloves of chopped garlic and cook for a little more, then add some chopped chillis, or maybe a few whole chillis, or maybe a little chilli powder. Whatever… then add a tin of tomatoes plus an inch of grated fresh ginger, 2 good tsp of ground cumin, 1 heaped tsp of ground coriander, 1 tsp of turmeric, and… hmm, that’s about it. I think. I then tend to add 500ml of water and let it simmer down. As it thickens you can add the paneer (although if you’ve fried the paneer like me, add it last, a couple of minutes before serving, so the crisp edges don’t go too soggy). When the sauce looks done, add a small bag of frozen garden peas or petit pois, stir through and heat for four minutes. Job done.